The Gilded Age will be remembered for the accomplishments of thousands of American thinkers, inventors, entrepreneurs, writers, and promoters of social justice. Few politicians had an impact on the tremendous change transforming America. The Presidency was at an all-time low in power and influence, and the Congress was rife with corruption. State and city leaders shared in the graft, and the public was kept largely unaware. Much like in the colonial days, Americans were not taking their orders from the top; rather, they were building a new society from its foundation. The American Presidents who resided in the White House from the end of the Civil War until the 1890s are sometimes called "the forgettable Presidents." A case-by-case study helps illustrates this point. 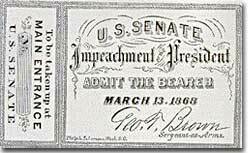 Andrew Johnson was so hated he was impeached and would have been removed from office were it not for a single Senate vote. Ulysses S. Grant was a war hero but was unprepared for public office. He had not held a single elected office prior to the Presidency and was totally naive to the workings of Washington. He relied heavily on the advice of insiders who were stealing public money. His secretary of war sold Indian land to investors and pocketed public money. His private secretary worked with officials in the Treasury Department to steal money raised from the tax on whiskey. Many members of his Administration were implicated in the Crédit Mobilier scandal, which defrauded the American public of common land. Grant himself seemed above these scandals, but lacked the political skill to control his staff or replace them with officers of integrity. Rutherford B. Hayes was elected in 1876 by a margin of one electoral vote. His successor was Rutherford B. Hayes. Hayes himself had tremendous integrity, but his Presidency was weakened by the means of his election. After the electoral votes were counted, his opponent, Samuel Tilden, already claimed a majority of the popular vote and needed just one electoral vote to win. Hayes needed twenty. Precisely twenty electoral votes were in dispute because the states submitted double returns — one proclaiming Hayes the victor, the other Tilden. A Republican-biased electoral commission awarded all 20 electoral votes to the Republican Hayes, and he won by just one electoral vote. While he was able to claim the White House, many considered his election a fraud, and his power to rule was diminished. James Garfield succeeded Hayes to the Presidency. After only four months, his life was cut short by an assassin's bullet. Charles Guiteau, the killer, was so upset with Garfield for overlooking him for a political job that he shot the President in cold blood on the platform of the Baltimore and Potomac train station. Vice-President Chester Arthur became the next leader. Although his political history was largely composed of appointments of friends, the tragedy that befell his predecessor led him to believe that the system had gone bad. He signed into law the Pendleton Civil Service Act, which opened many jobs to competitive exam rather than political connections. The Republican Party rewarded him by refusing his nomination for the Presidency in 1884. One President impeached, one President drowning in corruption, one President elected by possible fraud, one President assassinated, and one disgraced by his own party for doing what he thought was right. Clearly this was not a good time in Presidential history. This was an era of Congressional supremacy. The Republican party dominated the Presidency and the Congress for most of these years. Both houses of Congress were full of representatives owned by big business. Laws regulating campaigns were minimal and big money bought a government that would not interfere. Similar conditions existed in the states. City governments were dominated by political machines. Members of a small network gained power and used the public treasury to stay in power — and grow fabulously rich in the process. Not until the dawn of the 20th century would serious attempts be made to correct the abuses of Gilded Age government. Biographical information on the 21st President, Chester A. Arthur, from the White House website. Rutherford B. Hayes was one of only 3 presidents to keep a diary while in office. In 1922 the diary (spanning 58 years) and some of his important letters were edited and published. Today the entire 5-volume, 3000+ page work is available online at this website. Try out the lightning-fast keyword search or browse through the "memorable quotes" page. Outstanding! 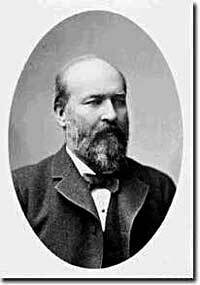 Here is a fact sheet on President Garfield from the Presidents of the United States website. This megasite delivers. In addition to 8 articles about Andrew Johnson's life and presidency, there are biographies of 28 individuals who figured in the President's impeachment, not to mention 200 original editorials, political cartoons and articles from Harper's Weekly, the nation's most influential publication during the Reconstruction Era. Illustrated throughout. 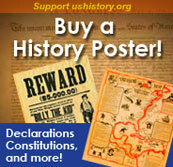 Check out the years 1868 through 1876 on this outstanding timeline for info about candidate and President Ulysses S. Grant. It includes details of the scandals that plagued his administration and brief excerpts of his inaugural addresses and other speeches and writings. Who really killed President Garfield? His doctors and Alexander Graham Bell!